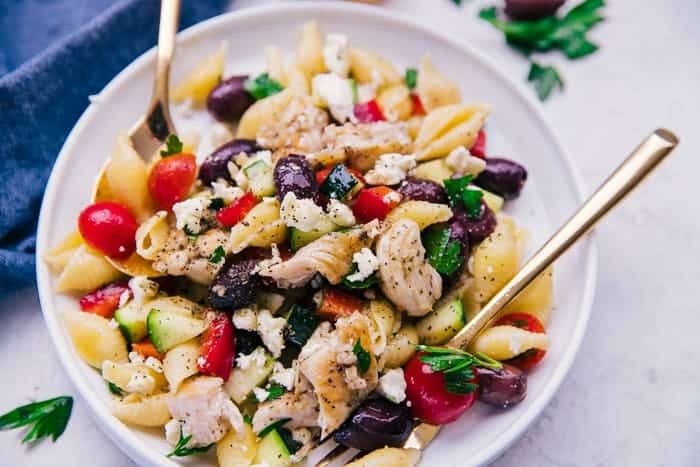 Simple, delicious, and bursting with flavor, this Greek Chicken Pasta Salad is the perfect side dish for all your summer cookouts and so much more! With the dawn of Summer comes the smell of fresh cut grass, the sounds of birds chirping and sprinklers tirelessly swishing back and forth, but nothing goes better with Summer than FOOD, cookouts, and time with family and friends. 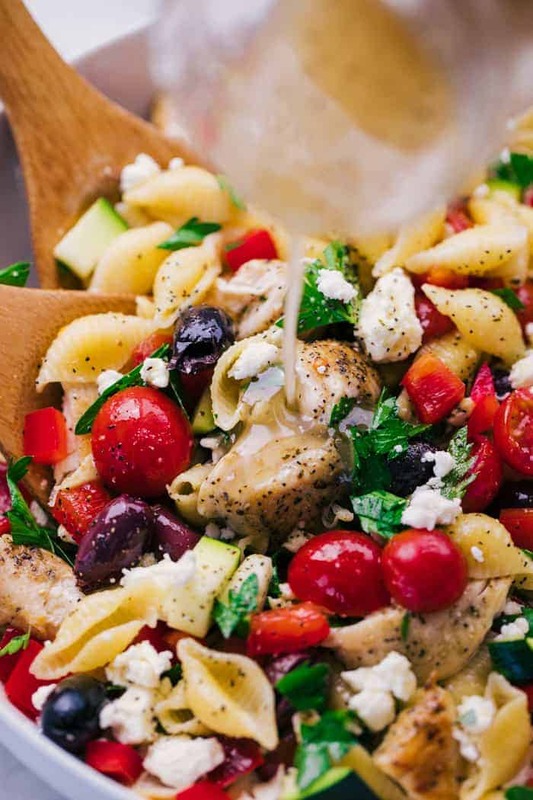 This Greek Chicken Pasta Salad is going to be silent, but sensational. The flavors are bold, yet not overbearing and the creamy texture of the dressing adds the perfect compliment to everything in the Chicken Pasta Salad. We love pasta salad! It is such a great side dish to accompany just about anything. Another one of our favorites is this Antipasto Pasta Salad. 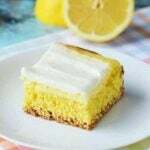 It takes very little prep work and it is a guest favorite! 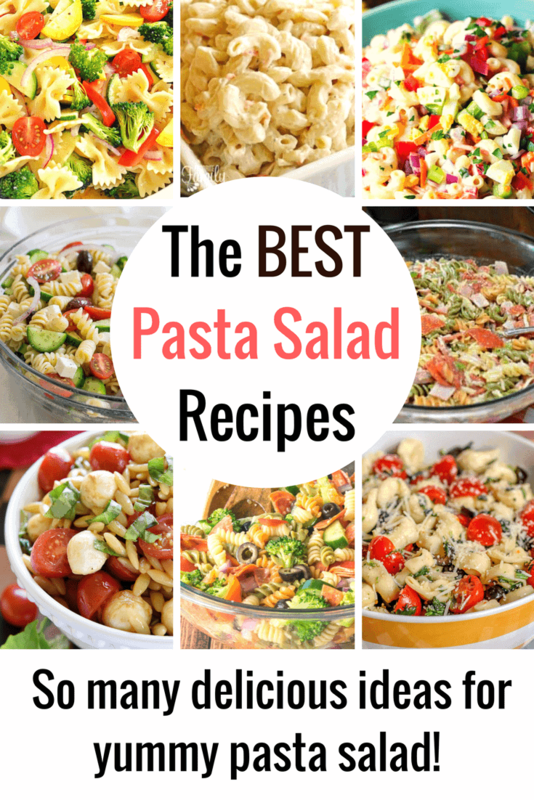 Be sure to check out some of these other Great Pasta Salad Recipes they are all pretty amazing! What are the different kinds of pasta? There are many different types of pastas making them very versatile for your likes and needs. Some types of pasta have slightly different textures than others, but here are a few that are fun to cook with. Farfalle, known as the bow tie pasta. Shells, which is what is in this Greek Chicken Pasta Salad. 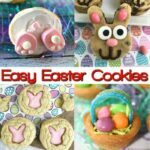 They come in different sizes, large enough to stuff and bake them. Angel hair, which has a smooth texture, is very elegant, and is the thinnest of all the pastas. Penne pasta, which is in the shape of a tube is great for holding in sauces. Gnocchi, is great for sauces that are thick and rich. They are considered to be a tiny dumpling. Cook pasta according to package directions, drain and set aside to cool. Season chicken with garlic salt and greek seasoning. Heat a large skillet over medium high heat and add 3 tablespoons of olive oil. Allow the oil to heat up for about 1 minute and then add in the chicken. Cook 5 minutes each side until golden brown on the outside and fully cooked on the inside. Remove from skillet let cool and then cut into 1/2 inch pieces. Cut all vegetables and place in a large serving bowl. Add in cooled pasta, chicken, and kalamata olives. Mix to combine. In a small mixing bowl make dressing: whisk together avocado oil, lemon juice, red wine vinegar, dried oregano, and minced garlic. When ready to serve pour dressing over salad and mix well to combine. Garnish with feta cheese, parsley and greek seasoning. Greek Chicken Pasta Salad will make a great side to all the grilling that will be going on this Summer. It is a lighter salad that is not overrun by dressing, and comes together quickly. To save some time you could buy the pre-cooked chicken breast and heat them up in your skillet to add to the salad. I like to cook the thin sliced chicken breast in the skillet, since they are so thin they cook up quickly. How do you cook chicken on the stove? This is a very easy and simple way to cook chicken on your stove. Using thin sliced chicken breast, pat dry and season with garlic salt, greek seasoning, and pepper. Heat a large skillet over medium high heat and add 2 tbsp of olive oil. Let the oil heat for 1 minute then add the chicken. Cook the chicken for 4-5 minutes. Flip and cook an additional 4-5 minutes on the other side. Remove from the stove and let cool. Slice and add to the salad. How do you make Greek Salad Dressing? Store in an airtight container until ready to pour over your salad. 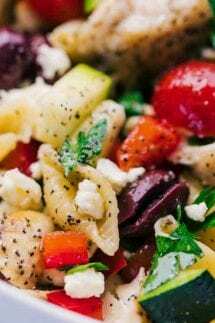 Greek Chicken Pasta Salad is a delicious salad for a warm Summer night or perfect for lunch with friends. This avocado tomato and cucumber salad or roasted potato salad are also great options to serve alongside your Summer grilling. Pat chicken dry and season chicken with greek seasoning, garlic salt, and pepper. Heat a large skillet over medium high heat and add 2 tbsp olive oil, the the oil heat for 1 minute. Add chicken and cook 5 minutes on each side. Set aside to cool, then slice chicken. 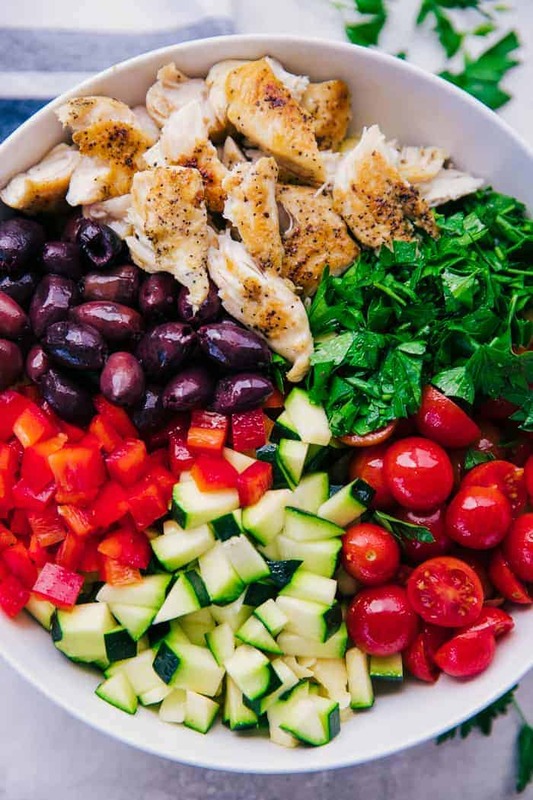 In a large bowl add cooked pasta, chicken, tomatoes, zucchini, red pepper, feta cheese, and kalmata olives. Mix to combine well. In a small bowl to make dressing whisk avocado oil, lemon juice, red wine vinegar, oregano, and minced garlic. Store in an airtight container until ready to serve salad. Then pour over pasta and mix well. Garnish with parsley and more greek seasoning if desire.